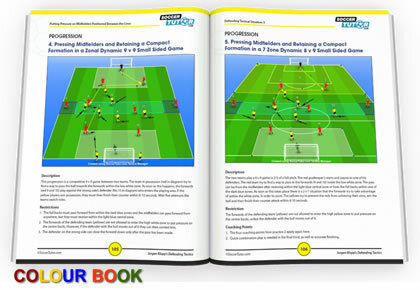 There are 91 tactical analysis topics which have been used to produce 14 sessions (53 practices) including functional practices, opposed/unopposed zone play, transition games, game situations and small sided games. This analysis has been used to produce 14 sessions (53 practices) including functional practices, opposed/unopposed zone play, transition games, game situations and small sided games. Jurgen Klopp's Borussia Dortmund are a very successful team that focus on high tempo pressing, preventing through balls and preparing for the transition from attack to defence when in possession. Jurgen Klopp has led his team to two Bundesliga titles, one German cup and the Champions League Final in 2013. I have watched Borussia Dortmund in many of their league and Champions league matches for the last few years and all of them during the 2013-2014 season. 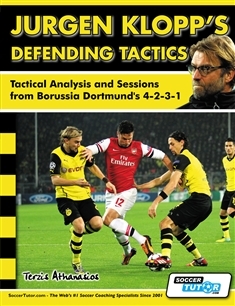 Over 1000 hours of research has enabled me to present a full tactical blueprint of Borussia Dortmund and supporting training sessions in this book and the Jurgen Klopp’s Defending Tactics book (other part of this book set). Pressing high up the field is very difficult to get right and maintain defensive cohesion when in transition. This book breaks out some very common problems that transition breakdown presents to the high press team. As a club that plays tiki taka and mainly 4-2-3-1 this is a great asset. My 4, 5 and 6 are so much better with the first few drills that we have added to our tactical preparations.